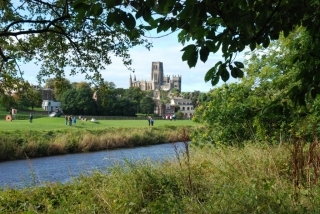 The River Wear in Durham is a beautiful stretch of water, but it is narrow, has many bends and bridges and has fast currents when in flood. Twelve racing clubs share this short 2km stretch of water along with fishermen, pleasure boats and other users. It is at times extremely crowded, often with a mix of experienced, faster crews and inexperienced, slower crews. Whilst there is equal access to all, this means that there are many potential hazards, many near misses, and unfortunately frequent accidents – with damage to boats and injuries to people. To go out unaccompanied on the river you need to know the rules of the river and be able to demonstrate your skills and watermanship. To avoid accidents you really need to be able to anticipate the actions of other river users and respond quickly and appropriately. Unfortunately it’s common to encounter crews on the wrong side of the river or stationary in the middle of the river. Darkness brings added hazards. British Rowing has issued guidance about lights on boats. Be aware that the local rule for navigation on the River Wear is white light on the bow and red on the stern. and be prepared for anything!